Please be advised: this article contains discussion of violence, hate speech and suicide throughout. Sitting before her class on the afternoon of Tuesday, Oct. 30, political science professor and director of the Jan Serie Center for Scholarship and Teaching (CST) Adrienne Christiansen was caught in two minds, unsure of what to do. The previous Saturday, a gunman had walked into the Tree of Life Synagogue in Pittsburgh, Pennsylvania and murdered 11 people. It was the deadliest attack on the Jewish community in United States history. Horrified by the shooting and facing her students for the first time after it, Christiansen had a difficult choice to make: to say something about the attack or remain silent. In a semester full of acts of violence and hate – both on campus and around the world – this dilemma has become an all-too-familiar experience for professors. In response to this concern, professors across academic disciplines are beginning to reach out to one another to ascertain how they should speak about violence, hate and tragedy in the classroom. Dosh said that faculty are eager to learn. He has personally participated in at least three structured conversations on the subject this semester alone, both within the political science department and with faculty across the college. In the past several years, the CST has hosted six separate meetings or events to facilitate this kind of dialogue among professors. Christiansen organized the first after a white supremacist murdered nine black churchgoers during a prayer service at the Emanuel African Methodist Episcopal Church in Charleston, South Carolina in June of 2015. The CST then led several sessions centered around how to talk about acts of violence in the classroom. But Christiansen and her fellow professors soon found there was much more to the conversation. Following Sosa-Wheelock’s death by suicide last February, professors met several times to process the loss and work through how they would address it with their students. This semester, the CST hosted yet another session to discuss the Tree of Life shooting. Over the course of these gatherings, faculty have expressed a diverse range of opinions and raised a number of questions. No two professors chose to speak up about violence, hate and tragedy in the same way. Many elected to say nothing at all. Assistant Mathematics, Statistics, and Computer Science Professor Getiria Onsongo ’04 has discussed several of these incidents in his classes, including the anti-semitic and anti-black graffiti found on campus this semester. But while many professors feel they should be doing something to acknowledge these so-called shocks, there are faculty members who disagree. Having run all of the related CST events, Christiansen has heard numerous justifications for staying silent. “Sometimes I’ve heard faculty say things like ‘I feel like students pay a very large amount of money to come here, and for me to provide my professional expertise on X subject, and the best things I can do in these moments of difficulty is to provide the thing they came for, rather than talk about something for which I’m woefully unprepared or maybe haven’t even thought through myself,’” she said. Even for professors who feel that speaking up is the right choice, it can be difficult to discern what warrants class time. Dosh raised similar concerns, pointing to the recent election of Jair Bolsonaro in Brazil as an example. “When Brazil elected a hard right-wing, military-oriented president recently, this was experienced by many as a shock in Brazil and elsewhere – Brazil taking a step towards dictatorship,” Dosh said. But despite many of these areas of concerns, professors from across campus are finding more and more ways in which their areas of study correlate to issues of violence and hate – a process that is facilitating more classroom discussions. Biology professor Devavani Chatterjea, for instance, has found a linguistic connection in her field: immunology. “I feel it’s a disciplinary and human obligation for me to talk about issues of violence and what it means to have weaponized bodies in society,” she continued. There remains, however, a concern that the issues affecting students could go unacknowledged in classes with course material that isn’t as clearly connected to political events. “It’s interesting to hear in classes in the social sciences and the humanities, I have friends who say ‘We spent the whole class talking about it,’ or ‘We had a really great conversation about it for part of the class,’” MCSG President and chemistry major Malik Mays ’19 said. Mays made that concern one of the themes of his successful campaign for the MCSG presidency last year. Some math and science professors, however, aren’t sure where the perception of silence is coming from. In response to the sentiment, all 27 members of the Math, Statistics, and Computer science department co-wrote and signed a letter addressing it. This letter served as the genesis of a department-wide effort to discuss how to address hate and violence in the classroom. Those professors are not alone in wanting to open up the dialogue with students on how serious real-world events are addressed in the classroom and on campus more generally. Santiago Padron ’21 is a member of the student organization No Hate at Mac. As a part of that group’s work, Padron has spoken with various faculty and administrators about what their acknowledging hate and violence can look like. In response to this disconnect, the political science department has considered sponsoring an event to give students a space to speak openly about addressing hate and violence with faculty. Christiansen contributed to development of the idea at a recent political science department meeting. “I think it’d be really helpful for faculty to hear a range of voices from students – where we are not talking to students, we are actually listening to students,” she said. Padron approved of the concept. Mays has experienced firsthand the loneliness of trying to operate in these spaces. “I’m more than just a chemistry major, I am more than just a student,” Mays said. “Whether I want to be or not, at the end of the day I am a black man and that carries a lot with it – it carries a lot of trauma and anxiety I haven’t really worked through yet, but it’s there. But certain faculty members have another anxiety about bringing conversations on violence, hate and tragedy into the classroom. These are emotionally-charged discussions, and contributing to them can be taxing – and even the most staunch advocates of speaking up can be stopped in their tracks by a fear of vulnerability. That Tuesday following the shooting in Pittsburgh, Christiansen arrived to her class fully intending to say something about the attack. But at the last minute, something stopped her. After class that day, one of Christiansen’s students, Lily Alexandroff ’21, approached her. She wrote an email to her class that afternoon apologizing for her silence. “I think to simply acknowledge this as a difficult moment is to recognize one’s humanity,” Christiansen said. Psychology professor Joan Ostrove has spent several classes discussing hate, violence and tragedy with her students. After the walk-in last year, she dedicated a whole class to processing the event. While that day was incredibly emotional for her, she felt that in the end, it was worth it. “I feel like more and more, we as professors are being called on by our students to be human,” Ostrove said. However uncomfortable it might be for professors, their vulnerability can be incredibly meaningful to students – especially those directly affected by violence and hate. 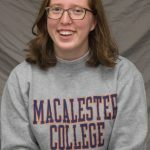 “I’d never met this professor before,” he continued, “I never talked to them that much, but in that moment, for the first time in 3 years being at Macalester, I felt like I was seen. For Ostrove, speaking up against hate and violence – however uncomfortable it might be – is the first step in the long process of creating a more just and equitable Macalester.